All the blades are of a 5160/D2 blended steel, nitrate treated and tempered to 58~60 on the Rockwellhardness scale. That is close to the hardest you can get any steel without brittleness setting in. It is the same hardness as an original Japanese Katana. These Swords can easily chop off cow’s head in one stroke! The knives can easily go through a car door. 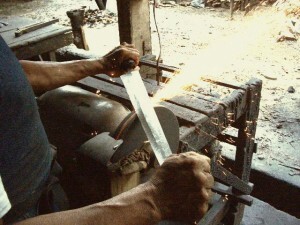 No one has this quality in craftsmanship and durability here in the US for Filipino blades! Unlike the many you see sold in martial art, gun or blade magazines, which are stamped out and sharpened then polished, you will never find anything like it with both, this kind of craftsmanship along with such high quality steel. Also take note that these blades are NOT made with the handle glued or screwed on! Each blade, from the beginning to the end, is one solid piece with a full tang in the shape of the handle! They are all individually hand made by a tribe in the Philippines the same way these expert blacksmiths have been making them for centuries. Every one of these Filipino historical and cultural weapons are actually combat ready to cut through just about anything! You can see by reading the information on each blade, that they are not made of re-melted spring steel like many other weapons from the Philippines on the tourist market today! We Guarantee, you will not find this kind of quality steel blades from the Philippines anywhere else but right here on the Traditional Filipino Weapons web site!